This painting is sometimes referred to as "Between the Curtains". It is a self-portrait that Frida painted as a gift for Leon Trotsky on his birthday. The paper she is holding dedicates the portrait to Leon: "To Leon Trotsky, with all my love, I dedicate this painting on 7th November 1937. Frida Kahlo in Saint Angel, Mexico". The portrait is painted with warm and soft colors, and Frida looks beautiful, seductive and self-confident. Trotsky, a Russian political rival of Stalin, was deeply committed to the theories of Marxism as a thinker, writer, organizer and military strategist. In 1936, Stalin finally chased the rival Trotsky into exile. Unable to find asylum in other countries, Frida's husband, Diego Rivera, persuaded the Mexican President Lazaro Cardenas to grant Trotsky asylum in Mexico. In January of 1937, Leon Trotsky and his wife, Natalia Sedova, arrived in Mexico and was greeted by Kahlo. She gave them the use of the Blue House in Coyoacan where they lived for the next two years. During that time the Rivera's and the Trotsky's spent a lot of time together and in the early summer of 1937 Frida and Leon began a secret love affair. Trotsky was notoriously attracted to pretty women, and Kahlo found his stature in the world, and in Diego's eyes, appealing. But, before long, Kahlo grew tired of Trotsky, whom she called "the old man" and the affair ended. After their relationship ended in July, Frida painted this self-portrait and gave it to Trotsky who hung it on the wall in his study. In April of 1939, the Trotsky's moved from the Blue House...Trotsky, at the request of his wife, left the painting behind. 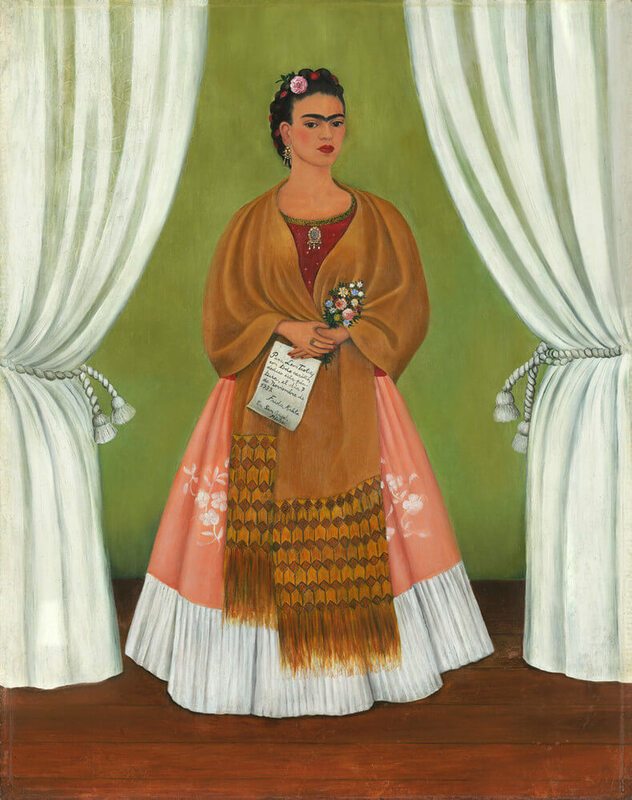 In November of 1938, this painting was shown at Kahlo's first solo exhibition at the Julien Levy Gallery in New York City. It was shown with the title: "Between the Curtains".